A robot from Hicksville High School FIRST® Team #1468 goes past a robot from Patchogue-Medford High School FIRST Team #329 in an attempt to shoot its ball into the goal during one of the matches at the 3rd Annual Half Hollow Hills Invitational, which took place on November 15 at Half Hollow Hills High School West in Dix Hills. On November 15, twenty-two teams — including two pre-rookie teams — took part in the 3rd Annual Half Hollow Hills Invitational at Half Hollow Hills High School West. The event was presented by School-Business Partnerships of Long Island, Inc. (SBPLI) and the Half Hollow Hills School District. 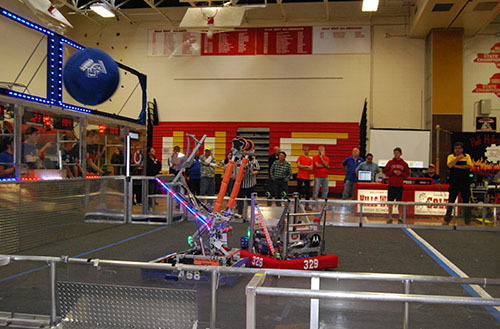 High school students used the same robots they built for the 2014 Long Island Regional FIRST® (For Inspiration and Recognition of Science and Technology) Robotics Competition. The robots battled on a 27-by-54-foot playing field with a truss suspended just over five feet above the floor, attempting to earn points by trying to shoot as many balls as possible into goals during a two-and-a-half-minute match. The purpose of this postseason event was to show visiting schools, teachers, and administrators how students are garnering an interest in STEM (Science, Technology, Engineering, and Mathematics) and why robotics programs are vital to their schools’ curriculum. Some of the school officials even had the opportunity to operate their teams’ robots during one of the day’s matches.